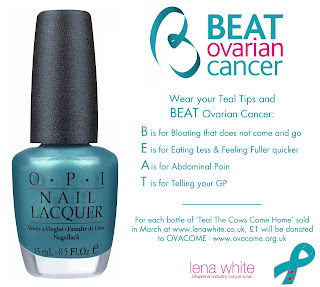 OPI are doing a charity collaboration this month as part of Ovarian Cancer Awareness Month with Ovacome. Ovacome is a charity which raises the awareness about the symptoms of Ovarian Cancer, by doing so they are helping to support women and hopefully encourage earlier diagnosis and a better chance of recovery. So to help support this amazing charity OPI have launched a very special nail polish called- Teal The Cows Come Home. I love the name, very fitting to the shade don't you think? As March is Ovarian Cancer Awareness month OPI collaborated with Ovacome and used the charity's recognised colour Teal, for every bottle sold in March Lena White are donating £1 to Ovacome. So come on ladies get your 'Teal Tips' at the ready and get supporting and raising awareness of this cause. OPI describe this shade as a deep turquoise, with a frost finish. Thanks for reading, have you seen this stunning shade?